"When [the EU] were faced with the unpalatable choice of a no deal, they backed down - will the prime minister learn the lesson of that?" DUP deputy leader Nigel Dodds on #Brexit: "We're facing a moment, almost, of national humiliation. It is a shambles from beginning to end"
DUP's Nigel Dodds calls Jeremy Corbyn's #Brexit offer "a Plan F or G" - adding "the way to a majority for a deal in the UK is with the Conservative party and the DUP"
What is more important to the DUP - delivering #Brexit, avoiding a Labour government, or protecting the UK? Independent MP Lady Sylvia Hermon says the DUP “does not speak for the majority of people in Northern Ireland”. DUP Deputy Leader Nigel Dodds says his party "represents more than anybody else". It comes as MPs debate the Brexit withdrawal deal in the House of Commons. "We have had good discussions today... We want to get a deal"
Nigel Dodds clearly upset with May. Tells her to 'learn the lessons' of last night: EU blink when confronted with no-deal. Nigel Dodds says it’s pathetic to see Theresa May holding out a “begging bowl”, and that you wouldn’t catch the DUP doing that sort of thing. NEW Number 10 gives short shrift to DUP’s deputy leader Nigel Dodds demand last night that Theresa May asks EU to reopen the exit deal to deal with the backstop. Does Theresa May have a plan for #Brexit? 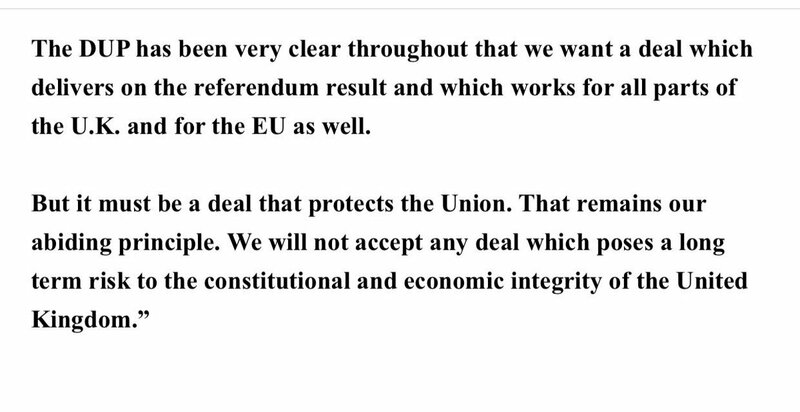 DUP deputy leader Nigel Dodds: "I am not entirely sure. It's very hard to know what she's thinking... I'm not sure that there's been a great strategy"
From a Brexiteer source: Nigel Dodds has confirmed that no significant progress has been made today between PM and DUP contrary to what PM told 1922. Speaker just upped the stakes re Brexit legal advice. Tells "it will be for me to decide - and I will not linger - whether there is an arguable case that a contempt has been committed…"
And DUP's Nigel Dodds supports him. The day just gets worse for PM Theresa May. DUP Deputy Leader Nigel Dodds MP says the UK rejected Barnier's offer a year ago: “This is neither a realistic nor sensible proposal from Michel Barnier. It disrespects the constitutional and economic integrity of the United Kingdom." NEW Nigel Dodds, who leads the DUP MPs supporting the Government: "Lectures by the PM putting the blame on others cannot disguise the responsibility her government bears for the current debacle and the fact that her agreement has been twice overwhelmingly rejected in Parliament." Not going well for PM. “PM clearly doesn’t listen” says Nigel Dodds, Westminster leader of the DUP, whose votes kept her in Downing Street who signed the Confidence & Supply Deal. “We stand up for UK or we vote for a vassal state and the break up of the UK”.